Born on November 10, 1923 in Yevpatoria, to a Karaite family. 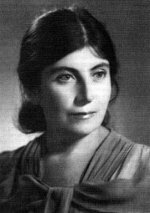 Her mother died early, the father was executed by the Fascists in 1941 while she escaped to Moscow where she was admitted to Moscow State University, the Philological Faculty, the Department of Art Criticism. In 1944, she started to work at the Pushkin State Museum of Fine Arts, Moscow, and worked there up to her death, in 2008. In 1945, graduated from the University with excellent marks. In 1949, defended the PhD dissertation, The Artistic Handicrafts in Ancient Egypt during the 18th Dynasty [Художественное ремесло древнего Египта периода XVIII династии]. In 1952, started to take part in archaeological expeditions, and for about 20 years worked at the site of Erebuni Fortress, Armenia (from 1959 as the head of the expedition). In 1964, headed the Department of Ancient East of the Pushkin Museum of Fine Arts, famous thanks to the V.S.Golenishchev collection of Ancient Egyptian Artifacts. Along with the designer V.F.Deul, she reorganized crucially the constant exhibition in 3 chambers thanks to which visitors obtained a chance to see all the best items of the Egyptian collection. She also took an active part in organizing important temporary exhibitions of Ancient Eastern arts, each of them turned out to be great cultural events in the life of Moscow starting from the late 1960s through 1970s. In 1990, defended the Habilitation Dissertation The Ancient Egyptian Glyptics [Древнеегипетская глиптика] at Tbilisi University. The Dissertation was mainly on scarabaei that she studied during almost her whole life. Later, in 1999, it was published as a book Ancient Egyptian Scarabaei [Древнеегипетские скарабеи]. The compilation of the list of all Ancient Egyptian artifacts kept at the museums of the former USSR was another major project of hers. It was initiated by Prof B.A.Turayev who gathered data on 1640 exhibits. Dr S. Hodjash carried on his work and her list contained about 3000 artifacts. This enormous work was presented in 1991, at the exhibition Ancient Egyptian Monuments Kept at the USSR Museums [Древнеегипетские памятники из музеев СССР] (with 565 exhibits shown), and the International Conference of Egyptologists The History of Egyptian Collections organized along with the exhibition. Regrettably, the proceedings of the conference were never published. Dr S. Hodjash was a friend and co-author of the preeminent St Petersburg Egyptologist Dr O.D. Berlev (1933-2002). They edited together three catalogues of Ancient Egyptian artifacts such as Monuments of Ancient Egypt. From the Museums of Russian Federation, Ukraine, Bielorussia, Caucasus, Middle Asia and Baltic States (Fribourg, 1998), The Egyptian Reliefs and Stelae in the Pushkin Museum of Fine Arts, Moscow (1982), Sculpture of Ancient Egypt [Скульптура древнего Египта в собрании ГМИИ] (2004). Hodjash S., Berlev O. The Egyptian Reliefs and Stelae in the Pushkin Museum of Fine Arts, Moscow. Aurora Art Publishers. Leningrad, 1982. At the IOM RAS Department of Middle Eastern and Near Eastern Studies, the monograph by Dr. Youli A. Ioannesyan Bayání Faith (Part I) will be discussed.